This cleanser leaves your skin feeling fresh, cleans impurities, it does what it says it does. I've been using it for more than 10 years, and even though my skin has changed, I don't feel any need to change this cleanser. It works as well now as it did 10 years ago. Love it! I'm 30 and have been suffering from awful hormonal skin on my chin since I was 12, that's 18 years of having, at best, inflamed, red skin on my chin and jawline and, at worst, horrendous blemishes that last days. I've used sooo many cleansers over the years, all different brands and price points, this is the first cleanser that has made a big difference in just a week. The pump is great, you don't need a full pump for your whole face so it will last for a long while, it's lovely to massage in, I like to leave it for a short while before rinsing off. I also use with my clarisonic which feels very invigorating. 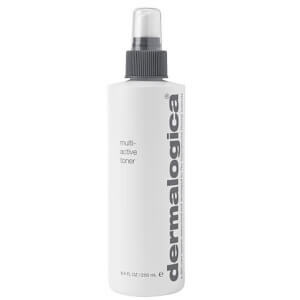 After the success of this cleanser I'm tempted to try more from the Dermalogica range. Will definitely re-buy. I love this cleanser and the pump action. Reduces waste and so easy to have in the shower and use each morning. These products are not cheap so saving from using too much is good news and the pump action does this. This is a great range to use. Love Demologica for using natural products. This is good for my skin and it feels clean and fresh. I just love Dermalogica products. This cleanser is the best for my oily skin with acne. My skin shines and looks healthy. That is the most important. I use it twice a day. I've had problems with congestion-build up under the skin - like pimples which didn't want to surface. 3 years ago I started using dermal clay cleaser - after two weeks they disappeared and never returned. Until I thought it wasn't a problem any longer and changed cleanser. Within days the problem was back. So bought the clay cleanser immediately - and a year down the line they haven't reappeared. If you have this problem, use it!!! It will freaking save you! I started using this cleanser some years ago after I read a review on lookfantastic.com recommending it for my type of skin problems. As a then 24/25-year-old I suffered from impurities underneath the skin's surface which was really unpleasant, sore and a confidence killer 'cause I felt like I was too old to suffer from acne. 2 weeks after I started using it, the problem went away to never return - until the day I felt like maybe my skin had become a little dry. I thought to myself - I've probably grown out of this - please it's been 4 years. So I bought the ultra calming cleanser from Dermalogica instead. Within 1 week (!) the impurities were back with a vengeance and I rushed on to lookfantastic.com to get my clay cleanser back. Now it's been another 2 years - my impurities (underneath the skin's surface) haven't returned and today I combine the Clay and Ultra Calming Cleanser for a perfect result and I doubt I'll ever stop. Six years of perfect skin - simple as that. I have very sensitive skin I can only describe my skin as a sponge that would soak up any kind of dirt and leave me with spots. The main problem I have now is congestion-dirt built up under the skin and appear as if you got small bumps on i.e. Forhead, cheeks. It can be a major downer for me but I have used Dermoligica for over 2yrs & the Dermal Clay Cleanser was one of the first products I used and It got rid of 80%of the congestion!I was soo Happy! I use loads of other Dermoligica products they truley are the best!